Introduced in 2017, a new high end line by Moultrie with some very impressive specs! We review the new Moultrie Signature Series S-50i along with Moultrie Mobile, and a Solar Charger to determine if we could expect action for Spring Turkey Season. *We used the enhanced setting for our tests. Video Resolution - There are two Video Resolution options as well. *For our test we used the FHD option only. Trigger Speed – the unit advertises 0.3 second trigger speed. Storage/Memory - Works with SD cards up to 32 GB. Memory cards are sold separately. Power/Batteries - The unit requires (12) AA batteries (Alkaline or Lithium batteries) with Lithium being the most preferable for cold weather and extended run times. Other Features – The S-50i mounts with a 1” wide by 4’ long mounting strap and the improved cinching buckle. Alternatively, you can mount the S-50i to any bracket which has a 1/4-20 standard tripod mount screw. The S-50i comes in three modes of operation. Motion Detect, Time-lapse, and Time-lapse+Motion. Motion Detect (Photo mode) – this is the standard use for most trail cams and it on the S-50i you can chose a resolution from 1920x1080 all the way to an impressive 6080x3420 which is an outstanding 20 mega-pixels. I took photos with this camera that could easily be blown up to poster sized prints to hang in my hunting cabin. Motion Detect (Video Mode) – This camera meets the Full HD specification of 1920x1080. This provides very detailed video and ultra-smooth motion. It operates at 30fps in 16:9 frame ratio. 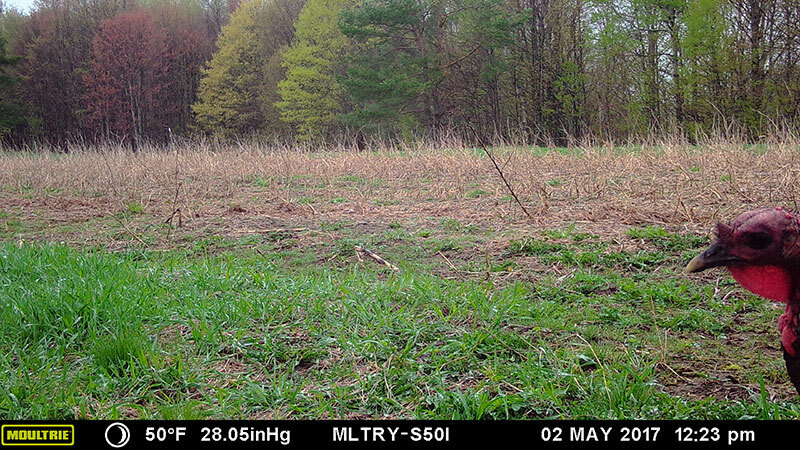 Motion Detect (Both Mode) – My favorite setting on other Moultrie cams is also available on the S-50i. This mode takes the first frame after detection as a photo and then shoots the video. I used this setting for my tests. Time-Lapse Mode – also called “plot mode” this allows you to choose your time intervals in either one or two time blocks. The unit no longer relies on sensors to detect sunrise and sunset, you now have total control over those settings. Time-Lapse + Motion – Another welcomed feature. This allows you to set the camera to take time lapse photos as described above, but it will also trigger on motion when detected. So you can have the best of both worlds. Here's a good photo showing the quality of the detail and color. Lots of photos displaying the 0.3 second trigger speed. 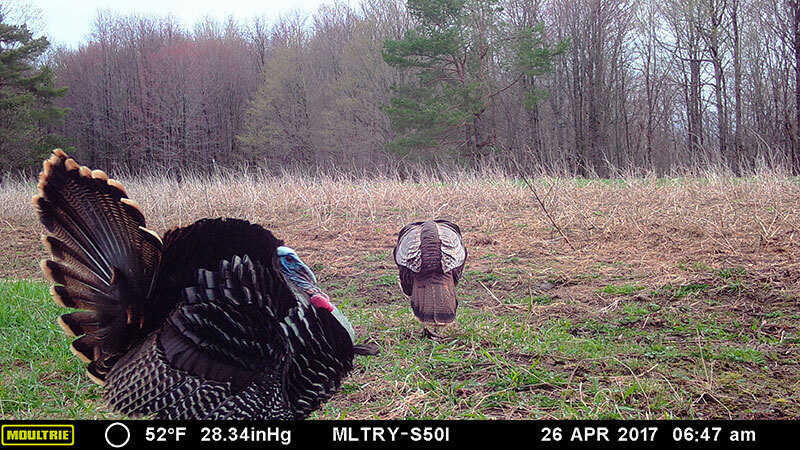 This Tom's head is barely in sensor range when it snaps a pic. This is a great example testing the detection and flash range. This deer is 110' from the cam. Good example of the quality shown in Signature Series Photo Mode. Great detail, color and exposure. The unit is mounted to a tree by the improved cinch strap that was introduced last year on other Moultrie Cams. 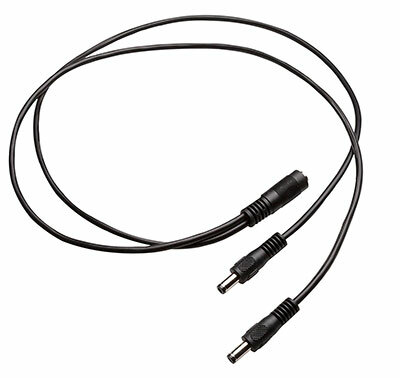 If you prefer to use a special mounting device, there is a threaded insert at the bottom of the camera which accepts a universal threaded screw. You open the unit with a bottom latch and there you can access the card slot, buttons, and the 2" LIVE view screen for aiming, photo review, and menu access. I found the menu easy to operate and intuitive. It is close to the standard format found on all newer Moultrie trail cams. The S-50i has the option of using a Quick Start setting. This allows you to get the unit activated quickly and intuitively. In this setting, the S-50i Trail Camera defaults to the most common settings with a 3 shot burst and a 30 second interval. In my opinion, the advanced options in this camera make it better suited for using Custom Settings but the good thing is now you have the option of using either setting. The unit requires (12) AA batteries. This is four more than most of the Moultrie Trail cameras. I did not test the S-50i for battery life due to the use of the Moultrie Power Panel - a solar unit that provides supplemental power to the camera. The unit claims a 0.3 second trigger. This appeared accurate given how quickly the camera triggered on animals moving across the camera's sensor. The Signature Series S-50i uses 48 No-Glow LEDs that make illumination both invisible and high performing. 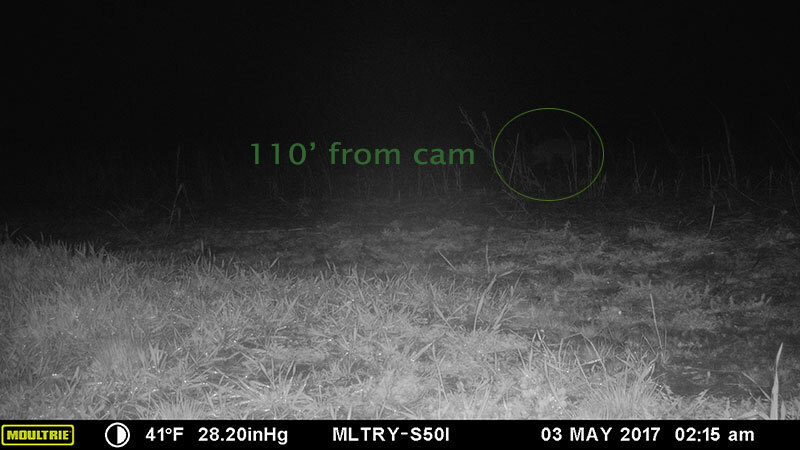 Flash range is advertised at 100' and I did capture a photo of two deer at 90' and believe the claim is accurate. The image quality of the S-50i is remarkable. I used enhanced mode for all photos. Night photos were clear and sharp and acceptable. Day photos were extremely sharp and highly detailed enough for enlarging photos to put on your wall. I expected remarkable photo quality. Video quality was excellent as well. I used the Full HD setting at all times and the detail, color, exposure, and motion displayed by this camera was terrific. It also had fantastic sound capture as well which you can hear in the video above. 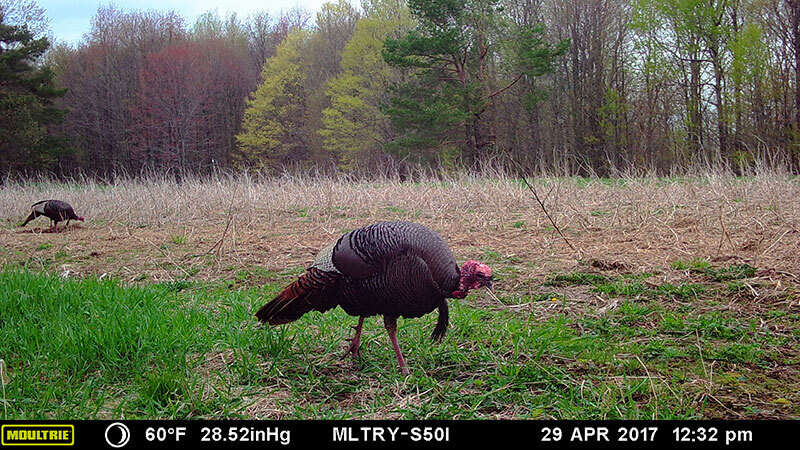 My goal was to use the camera prior to turkey season in order to get a sense for activity on my New York farm. 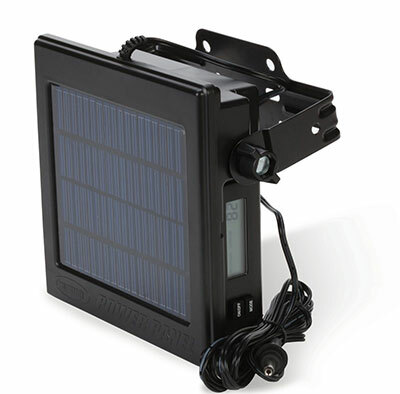 I coupled the camera with a Moultrie Mobile modem along with a Moultrie Power Panel solar unit. 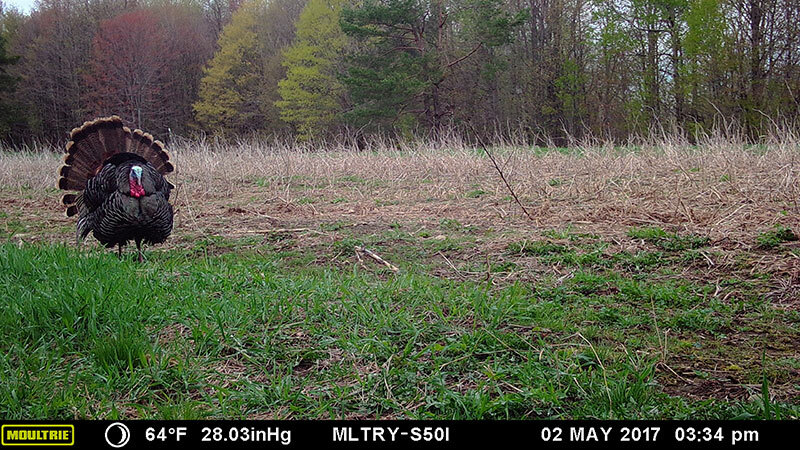 I knew immediately that the quality of this trail camera was evident when my first photos were sent wirelessly back to my home. Simply outstanding in all regards. 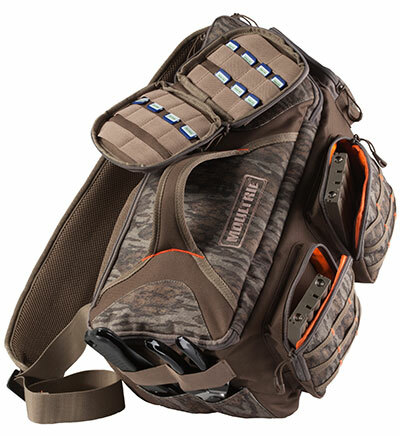 The Signature Series line is now Moultrie's top end. It operates similar to other lines however the resolution, trigger speed, detection range, and no-glow flash range is greatly enhanced. The footprint is not as small as the management series camera with less features, but it is not large. I can easily fit 10 units in my day pack or five units in Moultrie's new field bag which I found to be an outstanding accessory. I did not have an opportunity to test battery life since I used this camera in conjunction with a solar panel. Moultrie advertises 28k photos (50/50 combination of day and night photos) when using the internal (12) AA batteries. Overall I found the camera to be outstanding in features and performance with advertised claims regarding trigger speed and detection range being accurate. 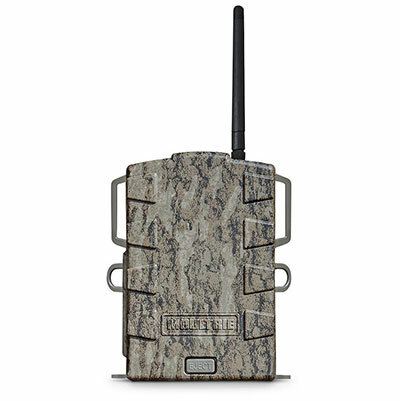 It was a strong performer, reliable and it paired very well with Moultrie Mobile and a PowerPanel solar unit. 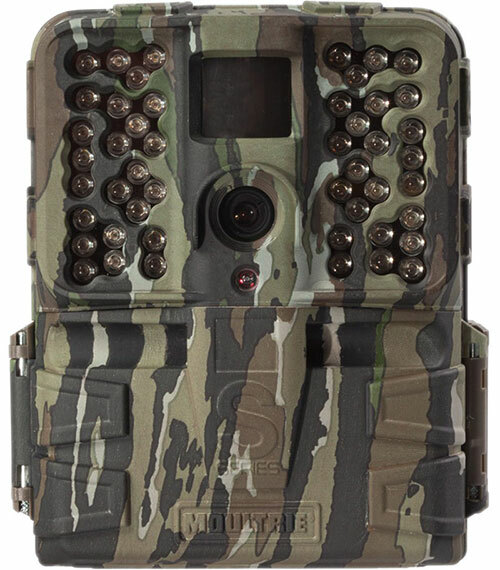 With an MSRP of $199 this is a very strong contender for a high end trail camera with exceptional performance.